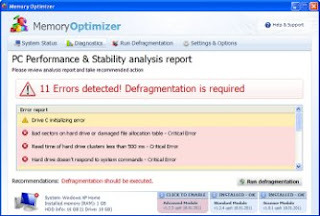 Memory Optimizer is a fake computer optimization software which states that it is designed to rescue hard disks and improve the performance of your computer. In reality, the program is totally scam. So never trust this software! MemoryOptimizer from the same family of malware as Disk Optimizer, Good Memory, Fast Disk, Disk OK, Memory Fixer, etc, It is distributed with the help of trojans. Thus, this malware can be installed without you noticing that, and does not require your agreement! MemoryOptimizer virus will also perform a fake scan and detect 11 critical errors on your computer. You should never trust the scan results, simply ignore all that it will display you. Remember, Memory Optimizer is created only for one to trick you into purchasing the full version of the software. Instead, remove it as soon as you notice it installed on the system. Follow the Memory Optimizer virus removal guidelines.